Considering its age (~2.500 years) the aqueduct, and mainly the tunnel (which is the most significant structure) is preserved in a very good condition and it is accessible along its total length. However the tunnel suffers locally from geological instabilities of varying severity. 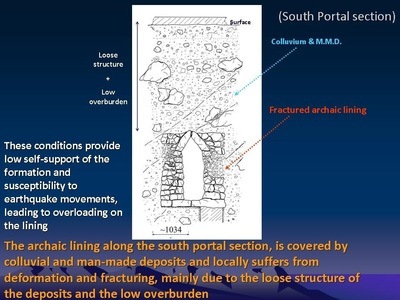 The main engineering geological problems along the tunnel are related to: the presence of marl & clayey shale horizons, and the intense fracturing of the limestone along major faults. Marls and shales provide to the molassic rockmass heterogeneity and low shear strength, as well as water movement along their contacts with limestones. 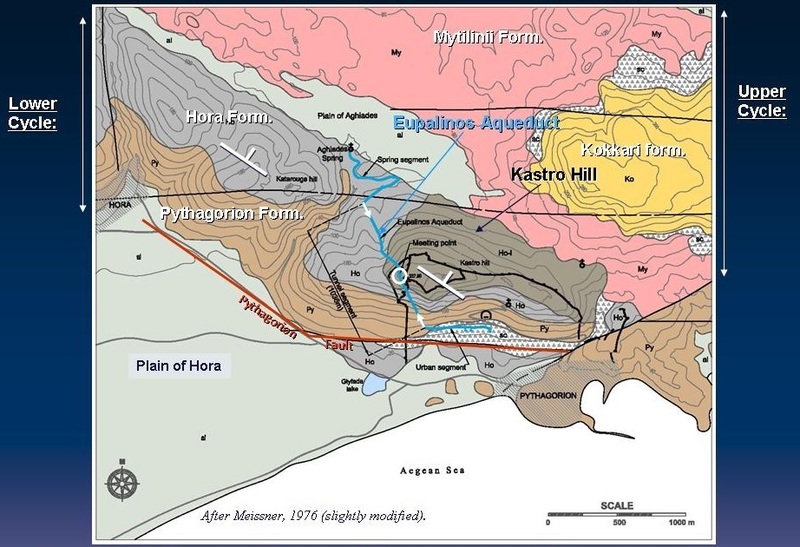 Geological map of Pythagorion & Hora area. (Meissner, 1976, slightly modified). The main and most impressive part of the aqueduct is the 1036m-long tunnel, which was bored from both sides of Kastro hill. 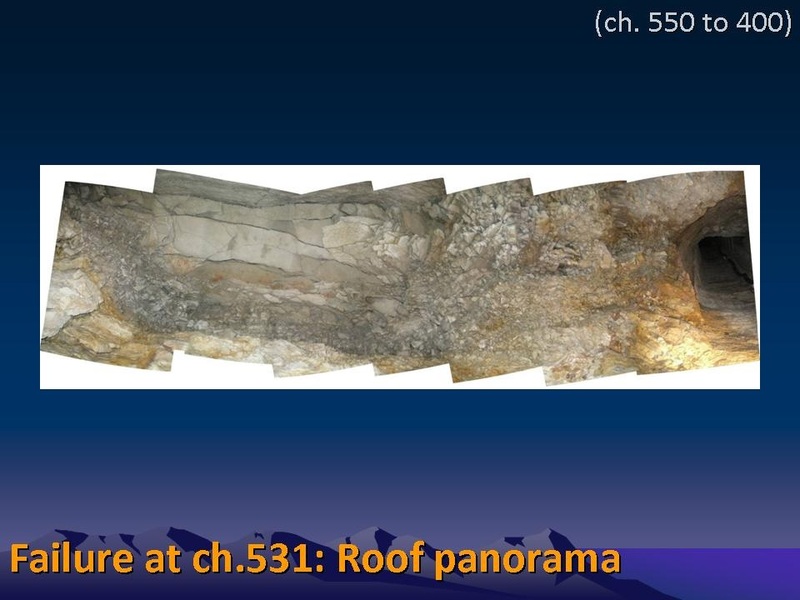 The two excavations met each other below the highest point of the hill. 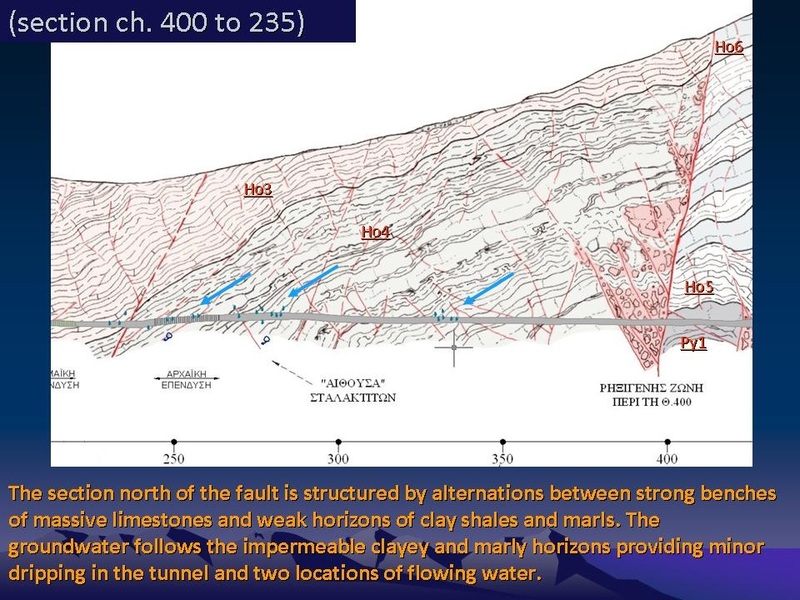 Pythagorion fault, which is considered active, controls the boundary with Hora plain. The NW-SE direction of this hill range is controlled by the dominant trend of strata of Pythagorion and Hora formations. 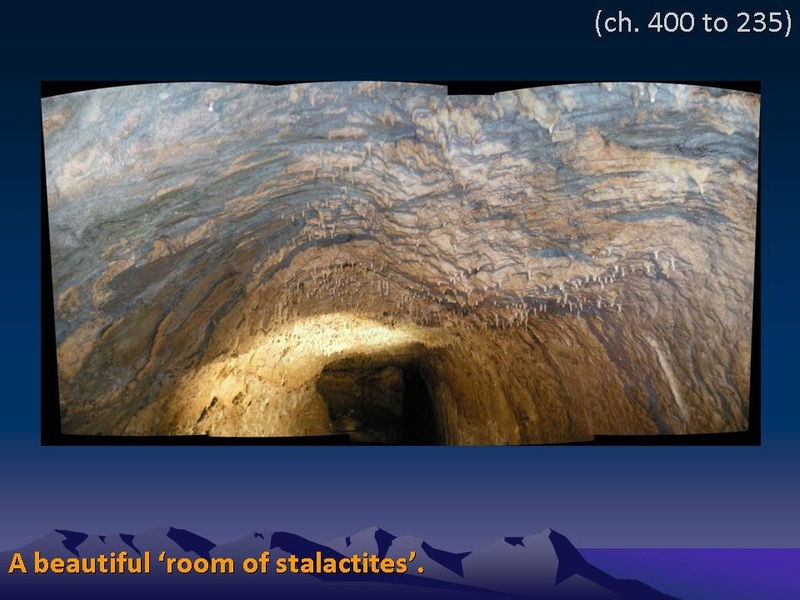 The result of that geological particularity is the asymmetry of the hill due to the dip direction of the strata. The summit of Kastro hill. Below this point the north and south excavations met each other. 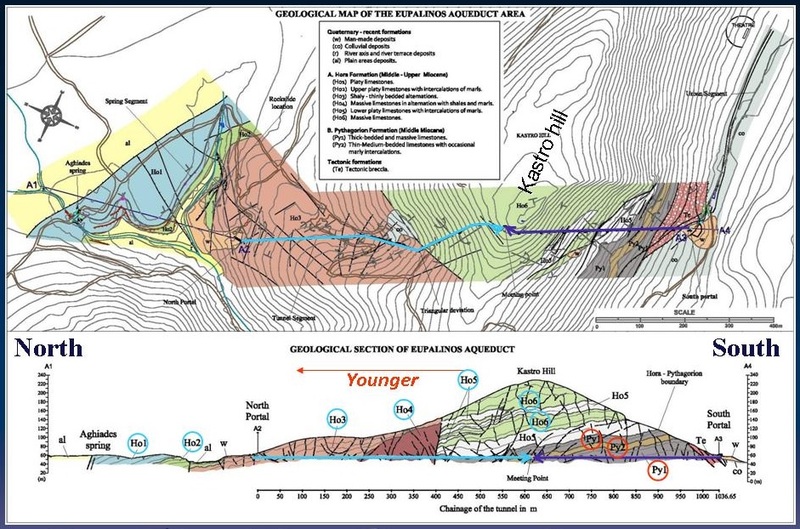 Geological map and Section of the Eupalinos Aqueduct. The tunnel was excavated both ways through the hill of Kastro, which is structured by a more or less monoclinal sequence of Pythagorion and Hora formations. 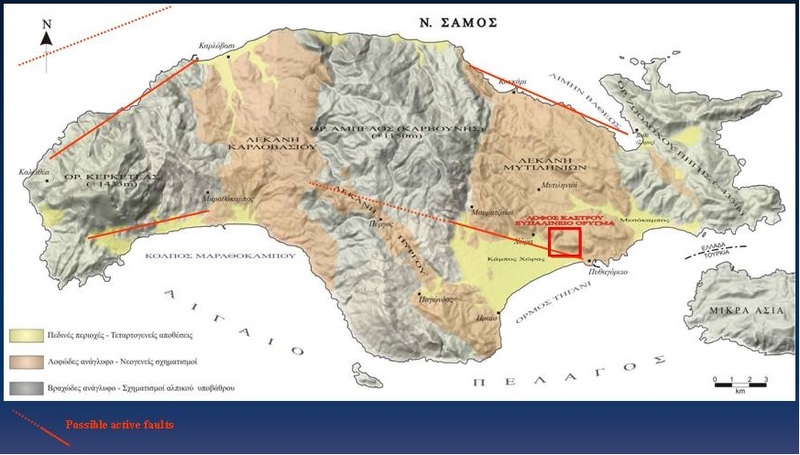 Pythagorion Units Py1 and Py2 appear at the south foothill, whilst the younger, overlying Hora Units Ho1 to Ho6 successively appear towards the north. The main lithofacies in the tunnel are: (a) medium-bedded to massive limestones, (b) alternations between marls, shales and platy limestones, and (c) tectonic breccia. 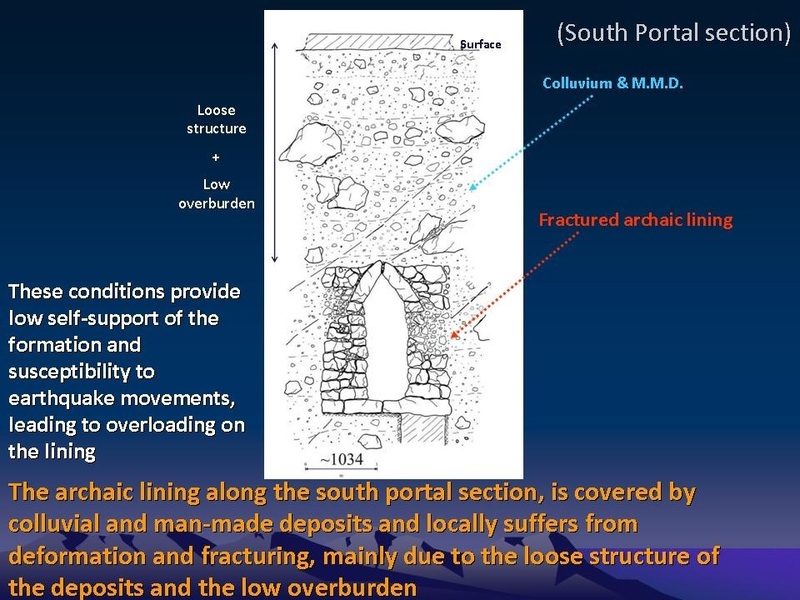 The main engineering geological problems along the tunnel are related to: the presence of marl & clayey shale horizons, and the intense fracturing of the limestone along major faults. 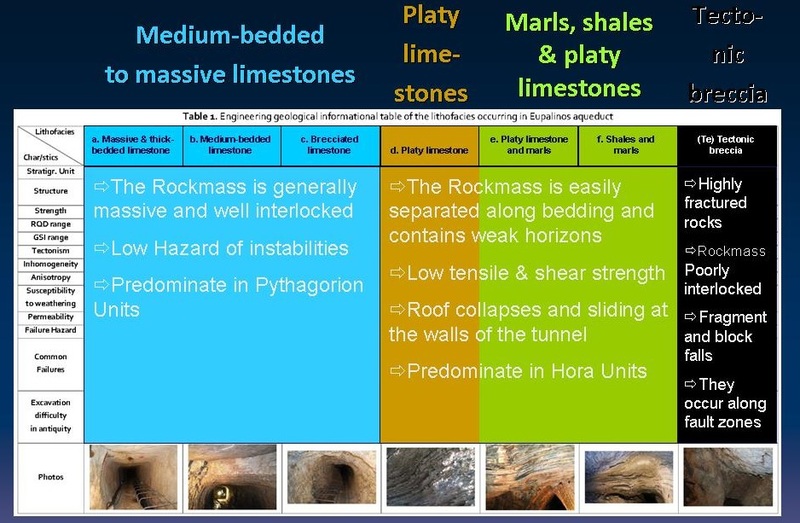 Marls and shales provide to the molassic rockmass heterogeneity and low shear strength, as well as water movement along their contacts with limestones. 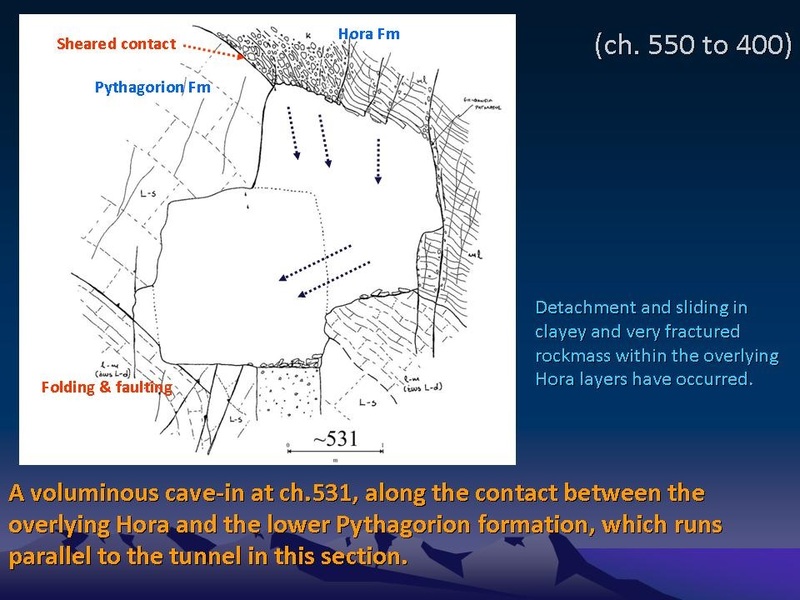 They are mostly present in the Hora Formation that dominates in the northern part of the tunnel. 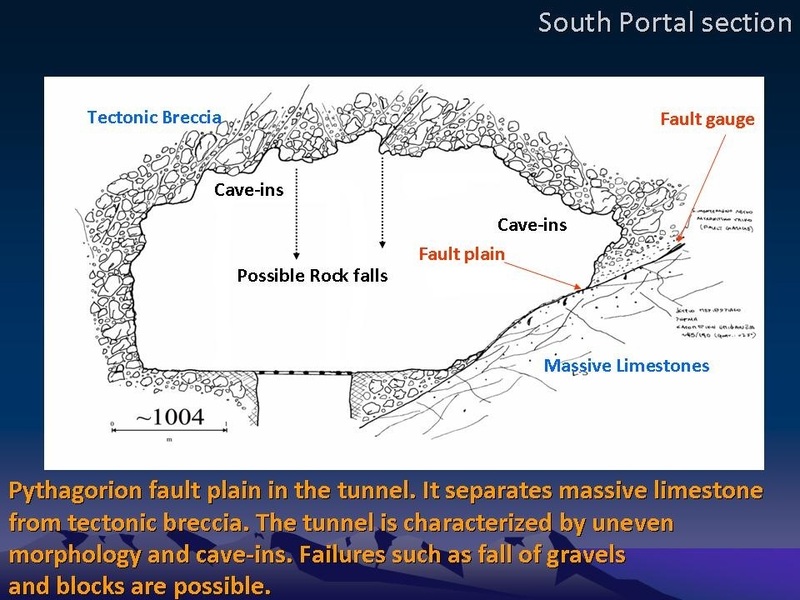 Transformation of massive limestone into tectonic breccia is most characteristic along the Pythagorion fault, at the southern portal, which is considered active. 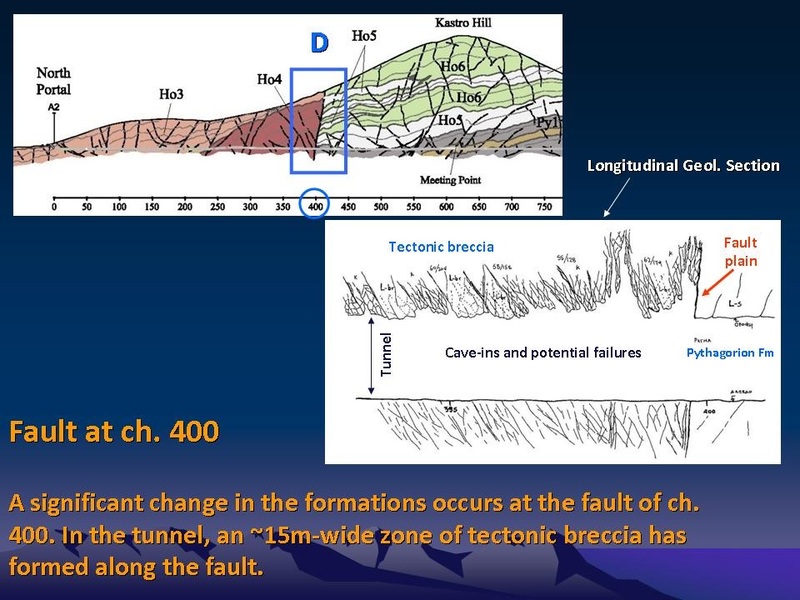 The orientation of bedding and discontinuities in relation to the tunnel direction, also affects tunnel stability. A collection of indicative sketces and photos which briefly describe the geological conditions and the geotechnical problems that was recognised along the tunnel are presented below. 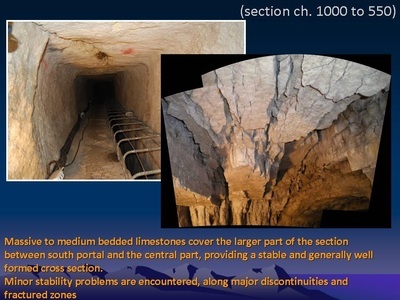 Based on a multi-discipline design study which also included a detailed geological mapping along the whole tunnel length, appropriate remedial measures were designed and are currently under construction in order to protect and restore the monument. Lyberis E., Dounias G., Ntouroupi A., Sotiropoulos L., Angistalis G. (2014). 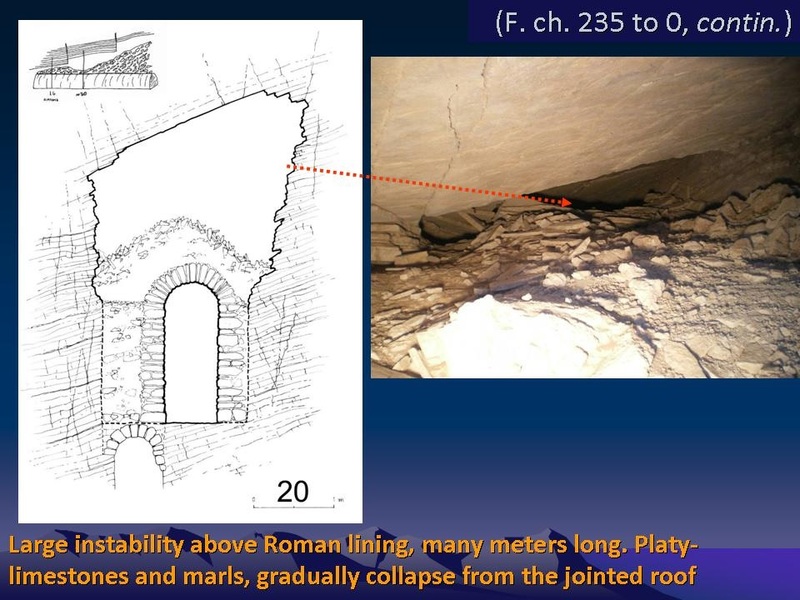 "The geology of Eupalinos Aqueduct, Samos Island, Greece". Proc. 2nd Eastern European Tunnelling Conference. Athens.